What is everyone's schedules looking like for June and July meetings? June 25th - ARRL Field Day. I've been invited to the Atlanta Radio Club's outing at Lucky Shoals Park, but I've been considering trying the Stone Mountain group's overnight setup as well. 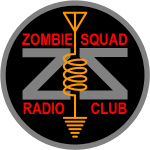 I hear that ZombieCon 2016 will be happening during this date, and there may well be ZS'ers on the air to talk to. July 7-11th - Play On Con 2016 (POC). POC is a convention Southeast of Birmingham Alabama that takes over a 4H summer camp for a weekend, and last-minute con-goers can still get bunk beds for $15/night. July 14-August 6th - Business trip to Switzerland. This means I'll be out of town for the July 30th Zombie Pub Crawl. Well, I'll be out of town starting August 6th until around DragonCon time. Maybe the second weekend of July?